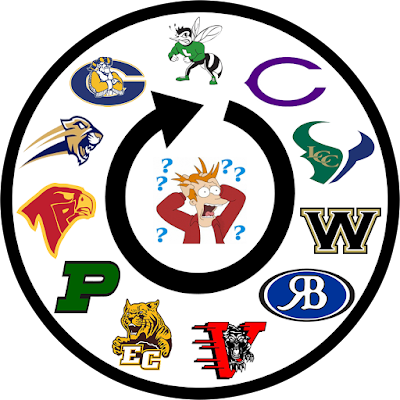 The Wheel of Parity proves that on any given gameday, no one is safe from defeat. The Top 3 remains intact with Helix, Mission Hills, and St. Augustine adding to their win totals last Friday. Cathedral Catholic falls to No. 8 after their Holy Bowl loss to the Saints. Westview is no longer undefeated after a heartbreaking loss to La Costa Canyon. With seven seconds left to play, Mavericks quarterback Tanner Clark dove into the end zone for the game-winning score. LCC climbs to No. 6 with the Wolverines behind them at No. 7. Valhalla put up an outstanding effort by holding Helix to a 21-14 lead at halftime, but the top ranked Highlanders pulled away with 21 unanswered points for the win. The Highlanders remain No. 1, while the Norsemen drop to No. 10. One week removed from defeating crosstown rival La Costa Canyon, the Carlsbad Lancers struck again with a convincing 21-6 triumph over Oceanside. The win marks their first in the series since 2005, and gives the Pirates their first three-game losing skid since that same season. Two straight marquee wins help the Lancers grab the No. 5 spot. Others receiving votes: Carlsbad (28 points, 5-3), San Marcos (15 points, 6-2), Bonita Vista (13 points, 6-2), Mater Dei Catholic (10 points, 7-1, includes forfeit loss), Christian (3 points, 6-2), Valhalla (3 points, 6-2), Granite Hills (2 points, 7-1), El Camino (1 point, 5-3), Mira Mesa (1 point, 6-2), Eastlake (1 point, 4-5). 24 sportswriters, sportscasters and CIF representatives from throughout the county vote in the weekly poll. This year's panel includes: John Maffei (San Diego Union-Tribune), Steve Brand, Terry Monahan, Don Norcross, Jim Lindgren, Tom Saxe and Rick Hoff (San Diego Union-Tribune stringers), Michael Bower (Pomerado News), Bill Dickens and Chris Davis (EastCountySports.com), Steve Dolan (Mountain Country 107.9-FM), John Kentera, Ted Mendenhall and Bob Petinak (The Mighty 1090), Rick Willis and Brandon Stone (KUSI-TV), Rick Smith (PartletonSports.com), Jerry Schniepp and John Labeta (CIF San Diego Section office), Bodie DeSilva (SanDiegoPreps.com), Drew Smith (sdcoastalsports.com), Lisa Lane (San Diego Preps Insider), Raymond Brown (sdfootball.net), R. Pena, C. Smith and M. Allen (MBASports-SDFNL Magazine).